We had gone to the Southern Alpes to the Ubaye valley, about 80 km east of Gap, to spend a week with Elisa, Guillaume, Emil and Alexandra in a cabin that we rented. 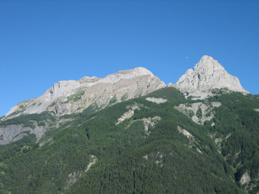 From our patio (and out bedroom) we could see this mountain very clearly towering over the city of Barcelonette. After a few days of bad weather that I had used to gather information about routes leading up to the summit, I was able to convince Catherine to leave right after breakfast and join me on this hike. We quickly found the paved road leading up to a ski resort, where we parked and set out on foot. The first half a kilometer or lead us up a forest road, before a nicely maintained trail verged of to the right and gradually led up to the mountain. Catherine was tiring quickly and she was also scared that we wouldn't be back in time to spend the day with the other (she was right in this regard, the hike did take us longer than I had thought). Therefore, she took many breaks, partly to catch her breath partly to debate with me whether to turn around or not. Eventually, however, the summit came into sight. We followed the trail leading up to the ridge leading up to the summit and then just stayed below that ridge to switchback our way up the steep slope. Interestingly, we saw a fair number of mountain goats that were idling around in the sun. They were not too close but we could still make out the younger ones and the impressive horns of the males. It was very impressive to see these animals manouveur on the very steep and slippery slopes of the mountain. About 90 minutes after we had began our hike, we reached the summit. The summit area consists of various smaller pinnacles, which could at first glance all be the highpoint. Sure enough, I was leading and went straight up the wrong pinnacle. Catherine was some distance behind me and went (instinctively) up to the correct one, where she then waited for me with a smirk on her face. She appeared to enjoy the hike after all, because she said that she was glad that I had brought her up here. We enjoyed the nice views from the summit of our vacation home, the city of Barcelonette far beneath us and of course of nearby Grand Seolane, the obvious high point in the area. Secretly, I had already put that one on my list, but I wasn't sure if I had time to do it this time. We left the summit when other people arrived there but not before having taking a picture of proof that we made it.